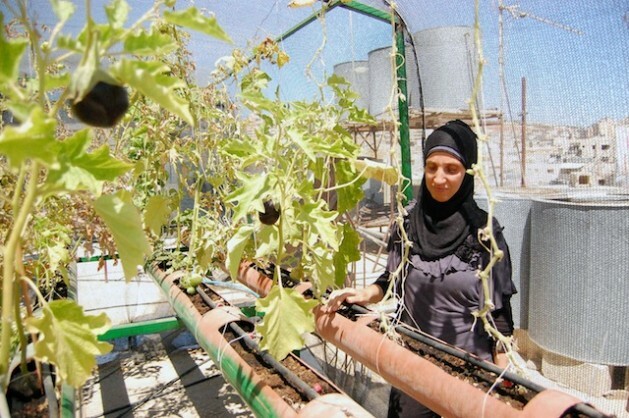 Asmahan Ramadan by her rooftop greenhouse in the Dheisheh refugee camp. Credit: Jillian Kestler-D’Amours/IPS. DHEISHEH REFUGEE CAMP, Occupied West Bank, Sep 9 2012 (IPS) - Asmahan Ramadan and her family have taken thousands of photos on the rooftop of their home. Not of themselves, or of the overcrowded Dheisheh refugee camp they see every day. “It’s like raising a child,” says Ramadan, smiling widely under the netting of the small greenhouse on the rooftop of her apartment building. Tomatoes, cucumbers, eggplant, green beans and other vegetables hang from dozens of plants set in four rows of tubing. Thin, black pipes with adjustable spouts dotted along their length are used to water their garden twice daily. Ramadan, her husband and their five children look after the plants like another family. They take pictures so as not to miss one millimetre of growth. Neighbours drop in regularly to check on the vegetables. More importantly, others are inspired. Today, 11 families are taking care of similar greenhouse gardens on the rooftops of their homes in the Dheisheh refugee camp near Bethlehem in the West Bank. Most importantly, the idea is spreading: a greenhouse has also been installed in the nearby Aida refugee camp and more are planned for the camps. Karama, a local Palestinian association based in Dheisheh that provides education and training programmes for women and youth, initiated the greenhouse project earlier this year. The organisation provided families with basic gardening infrastructure and plant seedlings, and funded the project thanks to a one-time 8,000 dollar donation from a former international volunteer. Karama volunteer Yasser Al Haj says the organisation chose families that had the greatest financial need for participating in the project. It also specifically aimed to make Palestinian women feel more independent and involved in meeting their families’ needs. About 13,000 Palestinians live in the 0.3 square-kilometre Dheisheh refugee camp. The camp suffers from a myriad of problems, including overcrowding, poor infrastructure, and a lack of schools. One-third of camp residents are unemployed and 15 percent of homes are not connected to the public sewerage system. Food insecurity levels improved overall by seven percent from 2010 to 2011 in the occupied Palestinian territories, according to data collected by the United Nations Relief and Works Agency for Palestine Refugees in the Near East (UNRWA). But the situation worsened for Palestinians living in West Bank refugee camps, where food insecurity rates registered at 29 percent in 2011. Alaa Tartir from Al Shabaka, a Palestinian policy network, who is co-author of the report ‘Farming Palestine for Freedom’, says farming can help lead Palestinians towards a more sustainable and self-sufficient economy and eventually, to food security. “The major impact of farming will be creating a self-sufficient and food secure nation that does not wait for the UNRWA or the Palestinian Authority or the international community to bring them food packages. That’s a starting point: when we start farm our lands, every single centimetre, including the roofs of our houses, will create a food secure nation,” Tartir tells IPS. For Asmahan Ramadan, whose family owned land and engaged in traditional agriculture in their original Palestinian village Zakaria, near Jerusalem, the experience of rooftop gardening has made her feel more connected to her family’s past.